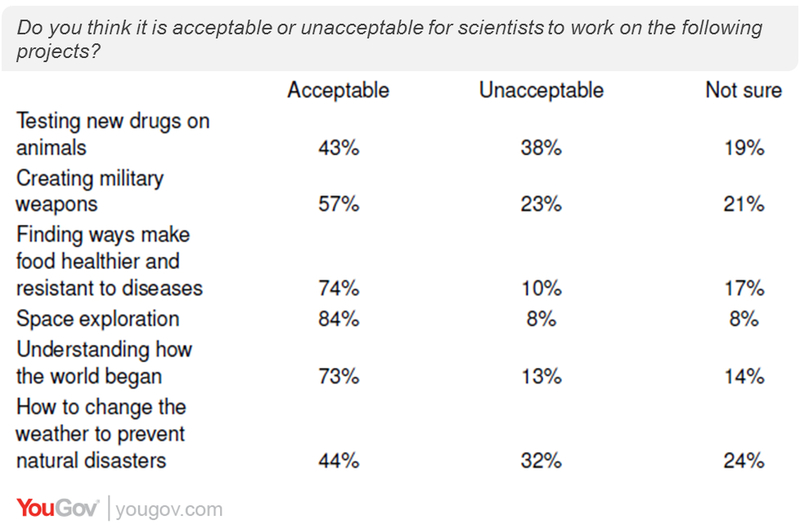 February 21, 2014, 7:43 a.m.
Americans have a complicated relationship with science. They aren’t sure how much they can trust scientists and what they say. They may think scientists should work on certain projects, but they may not believe the results. And in the latest Economist/YouGov Poll, attitudes towards science mix with religious beliefs and political feelings. A majority of Republicans give scientists little or no credence when they speak on the environment or on evolution. Overall, just 30% say they trust scientists to tell the truth “completely” or “a lot.” About the same percentage, 31%, trust them “only a little” or “not at all.” Democrats and Republicans are equally skeptical, but Democrats are nearly twice as likely as Republicans to give scientists a lot of trust. Americans of all political persuasions agree about scientists’ veracity when they speak on the safety of food and drugs – with slightly more expressing skepticism than offering a lot of trust. But the parties divide dramatically when it comes to the environment and climate change -- and when it comes to describing how the world was created. 53% of Republicans say they trust scientists only a little or not at all when it comes to the environment, 60% are dubious when it comes to scientific statements on climate change, and 54% trust scientists only a little or even less when it comes to describing how the world was created. On environmental issues, on and climate change specifically, majorities of Democrats give scientists a lot of confidence. 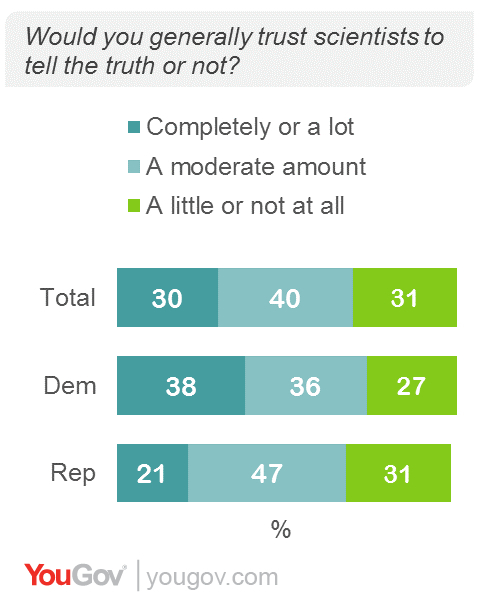 42% of Democrats say that about scientific statements about how the world was created. 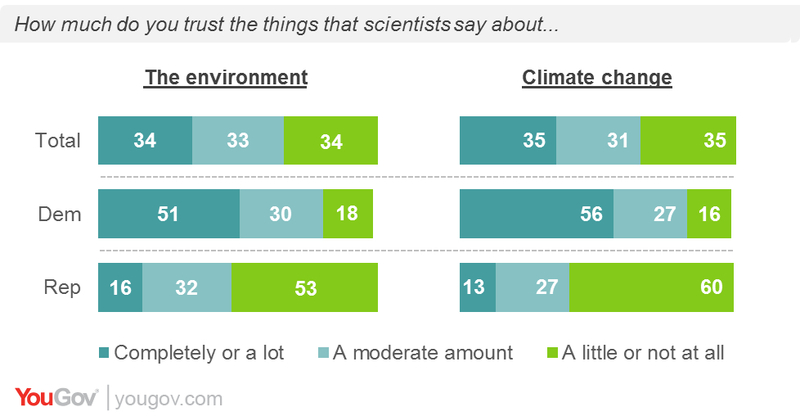 Americans occasionally hold contrasting views between their own beliefs and what they believe scientists should be doing. Those contradictory beliefs are expressed on several levels, as the public believe scientists should be working in some area where – as of now – they may reject the outcomes of scientific endeavors. For example, by two to one, American say it’s acceptable for scientists to create military weapons – even though when asked what one invention they wish had never been invented, atomic weapons tops the list. The American public say that today just as they did 67 years ago, when Gallup asked the same question in 1947. 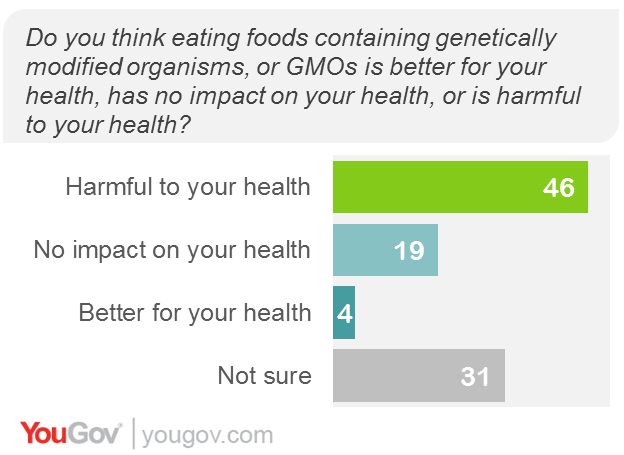 An overwhelming majority think it’s appropriate for scientists to work on ways to make food healthier and resistant to disease. Yet nearly half view genetically modified foods – which do include those modified to make them disease-resistant -- as harmful to health. 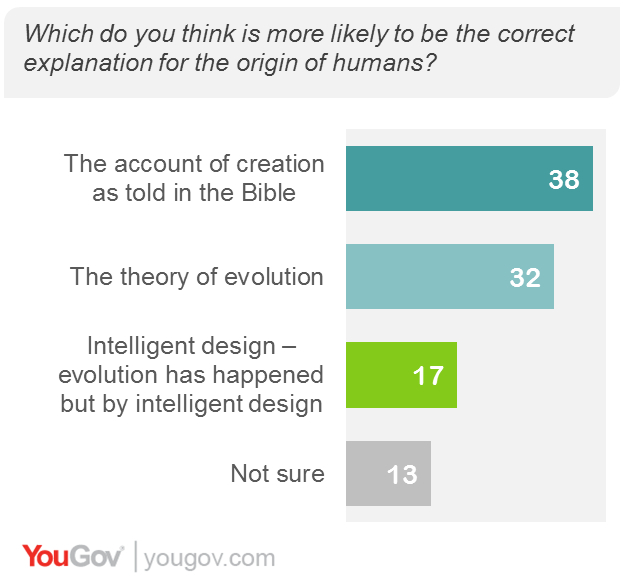 Although just a third accept the theory of evolution (with more than half believing that there was some intelligence at work in creation – either saying that the Bible’s story of creation is accurate, or that while evolution may have taken place, it was guided by some sort of intelligent design), three in four think it is acceptable for scientists to explore how the world began. More controversial is animal research, even when it is done to test new drug. Americans are closely divided on whether it is appropriate. Women, by 46% to 34%, say drug testing on animals is inappropriate. The public is also divided on whether or not scientists should work on trying to change the weather to prevent disasters. 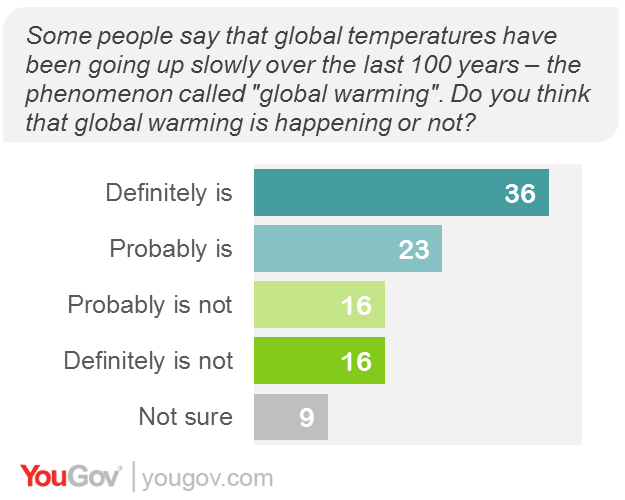 On this issue, one where many Americans say they don’t believe scientists all that much, most Americans are willing to admit that temperatures have been getting warmer in the last 100 years. Partisan differences are relatively small when it comes to what scientists should be doing. Republicans are much more likely than Democrats, however, to say it’s appropriate for scientists to work on military weaponry. There is only a ten-point difference between Republicans and Democrats on the appropriateness of trying to change weather patterns to avoid natural disasters, but Republicans are closely divided on this, while Democrats favor scientific work by two to one. There are sizable political differences when Americans are asked exactly what they personally believe. 51% of Republicans say they believe the account of creation as told in the Bible, compared with 36% of Democrats and 29% of independents. 56% of Republicans say global warming is probably or definitely not happening. Just 10% of Democrats and 33% of independents agree with them. However, Republicans, Democrats and independents have similar views on genetically modified foods: nearly half in all groups believe they are harmful to health. 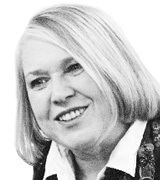 Sometimes it seems attitudes towards science is becoming a matter of faith versus reason. Atheists and agnostics are much more likely to put faith in the words of scientists than are Protestants or Catholics – but eight in ten of non-believers think the worlds was created through evolution, more than twice as many people as among Americans overall. 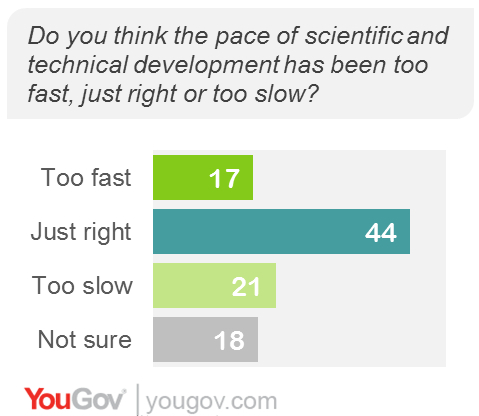 Non-believers would like to see even more scientific activity – twice as many of them as the country overall say the pace of scientific and technical development has been too slow. Overall, Americans are evenly divided on how science has progressed. One old scientific controversy, fluoridating drinking water to prevent tooth decay, doesn’t generate a political division any more. But that political debate is 50 years old. Though Americans overall approve of fluoridated water today, one in four have no opinion, and one in four disapprove – a feeling shared by liberals and conservatives and one that is strongest in the West. In an October 1965 Gallup Poll, 64% approved of fluoridating water, and fewer than one in five had no opinion.